ws-form-pro.zip for the PRO version. Click ‘Plugins’ from the WordPress administration menu on the left side of your screen. Click ‘Add New’ at the top of your screen. Click ‘Upload Plugin’ at the top of your screen. Choose the ZIP file of the plugin from your computer and click ‘Install Now’. Click ‘Activate’ to activate WS Form. 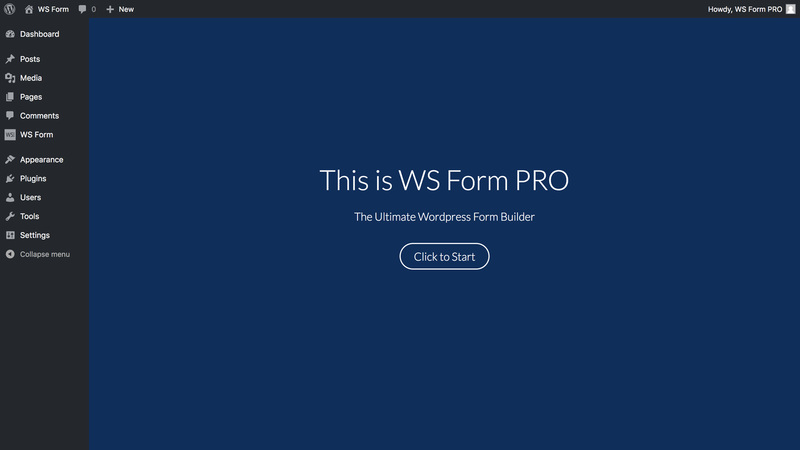 If you just installed WS Form or WS Form PRO, the first time you access any of its features you will be presented with the welcome screen. The welcome screen asks a series of quick questions to get you started. Answer each of the questions, and WS Form will ensure the settings are configured to suit your experience level and also the theme you are using on your website. Once you have purchased the plugin, you will be provided with a license key and a link to download a ZIP installation file both in your web browser and in the order confirmation email. Licensing the plugin ensures you will receive software updates and support. Click ‘WS Form’ from the WordPress administration menu on the left side of your screen. Click ‘Settings’ from the same menu. Click the ‘License’ or appropriate ‘Plugin’ tab on the settings page. Enter your license key and click ‘Activate’.